Are you a heart and soul homeschool mama, or do you want to be one? Do you feel like a top which needs to quit spinning? Round and round you go, but nothing really happens. As a busy wife, mother of six, and work-at-home mom, Gena Suarez, publisher of The Old Schoolhouse Magazine, knows what it's like to perform the great balancing act of managing home and school (and a business, too!). So how do I do it all? I don't. In the interest of being transparent (and keeping it all honest), I'll admit it. I fail at keeping it all together. Epic failure. At any given time, you will find dirty dishes on my kitchen counters (what counters?). . . . You know what? We're balanced where it counts. There it is. We love the Lord, we have our kids at home where they belong . . . the rest will come later when the two babies get bigger. Until then, I'll kick the dust bunnies back under the couches where they go and we'll mop the hardwood floors another day. Well, then. Don't do it all just do the important things with gusto. You'll laugh (and maybe cry) as Gena shares what homeschooling is like at her house. Discover how lots of blood, sweat, prayers, and tears are making her the homeschool mama God wants her to be and Gena is quick to say that He's not finished with her yet. As you read Gena's message, you'll be reassured to know that the Lord is always ready to help you with all of your questions via His Word, the Bible. Your homeschool doesn't have to be convoluted, confused, and tangled up, nor do you have to muddle through the season of homeschooling you are in. Gena believes homeschooling can be orderly, lovely, light, and fun. Rewarding, fulfilling, blessed. Drop the extra junk even if it means the house doesn't stay as clean as it used to. Shrug off the daily stresses that come from those 'spelling words tantrums' or the messy bedroom you expected cleaned up three hours ago. . . . Stop and read God's Word, pray, and lean on Him for direction. 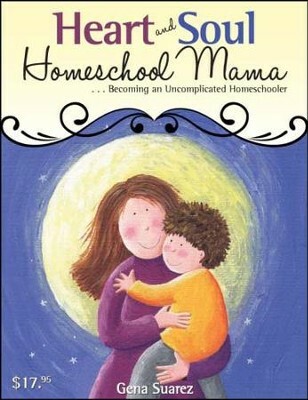 I'm the author/artist and I want to review Heart and Soul Homeschool Mama - PDF Download [Download].